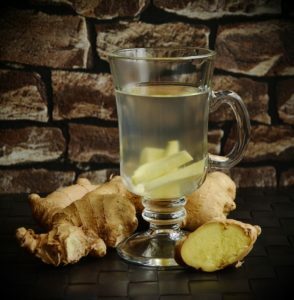 Ginger tea helps with colds – and is easy to make at home! It also has positive effects on motion sickness, migraines, and digestive issues. With these simple directions, you’ll be making your own healthy infusion from fresh ginger in no time! Wash the ginger root thoroughly but leave the skin intact. It contains many important nutrients that benefit your health. After washing, chop off a 5 cm (2 inch) piece of the ginger root and cut it into thin slices or finely grate it. Next, put the sliced/grated ginger into a cup and pour boiling water over it. Let your infusion steep for approximately ten minutes. Done! Depending on your taste, you can sweeten the ginger tea with honey or drink it plain. Enjoy the infusion as hot as possible, sipping it before or during mealtime.